A system and method for replacing a key is described herein. 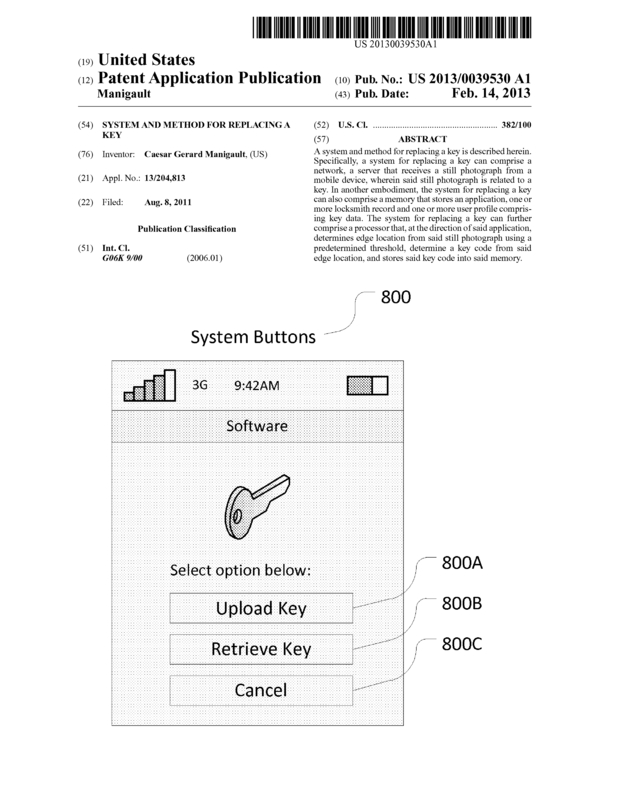 Specifically, a system for replacing a key can comprise a network, a server that receives a still photograph from a mobile device, wherein said still photograph is related to a key. In another embodiment, the system for replacing a key can also comprise a memory that stores an application, one or more locksmith record and one or more user profile comprising key data. The system for replacing a key can further comprise a processor that, at the direction of said application, determines edge location from said still photograph using a predetermined threshold, determine a key code from said edge location, and stores said key code into said memory. We have developed the Key generation technology PKI "Public/Private Key Image" to be used as a encryption mechanism which can be applied to a variety of products such as Wireless devices, OS platforms, Key Duplication for Automotive, Residential, Commercial and many more Applications. Page created at 2019-04-25 20:45:04, Patent Auction Time.